The question I had before viewing this film was “Is this a film-noir or not?” I have no degree in film, and this doesn’t have the traditional technical aspects of a true film noir, and from what research I can find, Otto Preminger didn’t want this to be a traditional film noir. 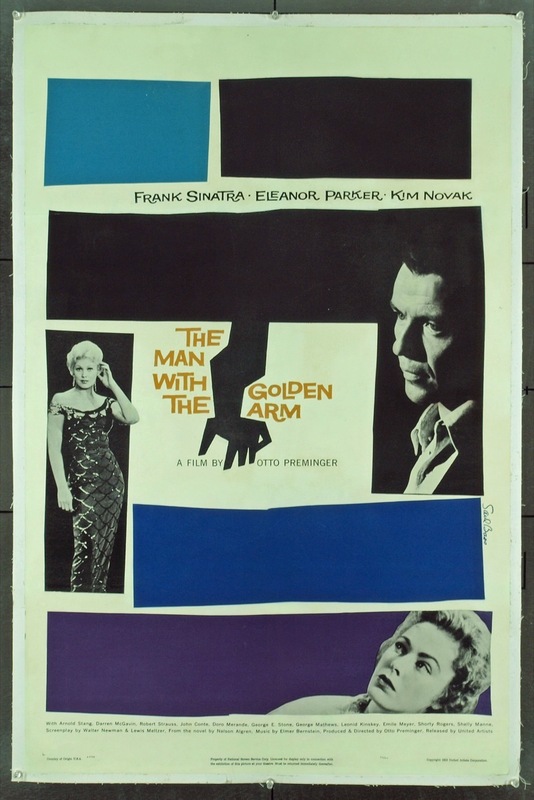 Preminger was a director that knew noir, he made quite a few, some before and some after this one. So could this be the very first neo-noir? All I know is this is filmed in black and white and doesn’t have as much shadow play as most films of this era. The subject matter on the other hand is very noir, it is gritty and dark. The movie is based on the book of the same name written by Nelson Algren. We have a convict fresh out of prison. He was arrested as a card dealer at an illegal casino and he has a drug problem. He comes out of prison, clean and with a new skill as a drummer. He is looking for a fresh start, but gets pulled into his old ways. His girl is bound to a wheel chair because of a spinal issue, she needs money to go to the doctors to help her find a cure. She is about as close to a femme fatale as you can get. There is also the beautiful neighbor down stairs who is the girl our hero really likes. We have an old boss that wants to control our hero and get him back into dealing cards for him. We got his best friend that is an honest hustler, he feels he is more honest than the criminals around him, but still a criminal. Murder, drugs, gambling, dancing-girls, hustlers, thugs and love triangles, sounds like noir to me. The film also pushed the boundaries of The Motion Picture Association of America’s film code and is one of the reasons the code was changed. Because of its drug use in this film it almost wasn’t approved. After this film, taboo subjects like drugs, kidnapping, abortion and prostitution were allowed in film. This would of course be big for noir and neo-noir films to come. This was nominated for 3 Academy Awards including Frank Sinatra’s one and only nomination for his portrayal of Frankie Machine. Eleanor Parker plays Frankie’s wheel chair bound girlfriend. Kim Novak plays their neighbor, Molly. Funny man Arnold Stang plays Frankie’s side kick Sparrow. Darren McGavin plays the underworld boss that is trying to control Frankie. So for those fans that have seen it, what do you think? Is it a film-noir or a well done crime drama? In either case it is a good film worth watching.